World Snooker Championships live streaming at Betfred. Watch all matches for free! Leading bookmaker Betfred are proud sponsors of the World Snooker Championships this year, so they are giving our readers the chance to watch their favourite players in action by offering a complete live streaming coverage throughout the tournament. Plus, new customers will receive a £30 free bet from a tenner! The most prestigious triple crown event in the game features 32 of the world's top cueists battling it out for a record £1.5 million in prize money and the right to etch their name onto one of the most famous trophies in sport. The 17-day show-piece event takes place at Sheffield's Crucible Theatre from April 16 to May 2. Both new and existing customers can watch the likes of 5-time winner Ronnie O’Sullivan and reigning champion Stuart Bingham in action. NBA live streaming at Bet365. Watch all matches on your smartphone, tablet or PC! 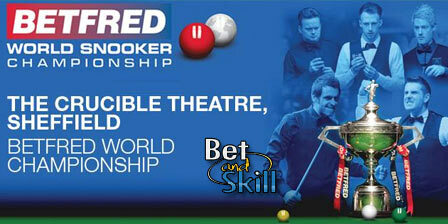 "World Snooker Championships live streaming at Betfred. Watch all matches for free!"